Sir David Tang’s slinky dining room in the Dorchester’s basement successfully manages to banish all thoughts of hotel restaurants from diners’ minds. The separate Park Lane entrance helps, as do art deco furnishings evoking 1930s Shanghai. Only the moneyed, multinational clientele remind you of the locality. 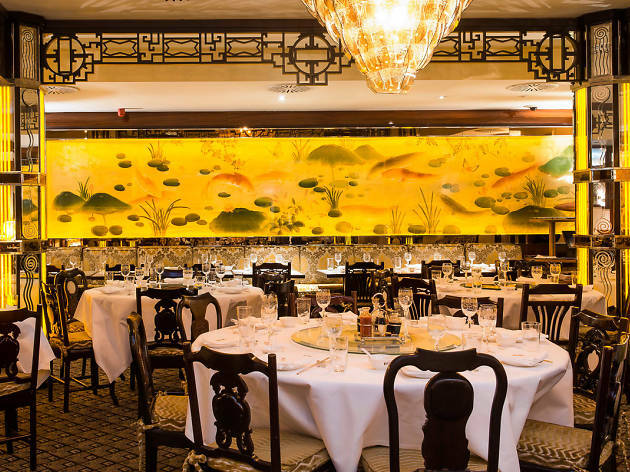 China Tang, which offers an alternative to the venerable Grill at the Dorchester, has formidable kitchen resources, so it would be a shame to stick to the western-oriented set meals (where cheung fun is renamed cannelloni) – though à la carte prices can intimidate. Despite the setting, Shanghainese cuisine is little in evidence, with Cantonese dominating. Hence, dim sum is a good choice, with most dishes costing around a fiver. Mango spring rolls with gai lan is among several vegetarian choices, and glutinous rice comes packed with seductive titbits for meat-eaters. Main course red-cooked lamb in clay pot is a marvellously savoury northern Chinese dish, the meat tender, the gravy profoundly flavoured, the texture enhanced by strips of resilient beancurd skin. Service was proper and polite, yet we noted some frayed edges: no one stationed at the ground-floor ‘greeter’s counter’; shouting in the kitchen drowning out diners’ conversation; and Hugh Grant reading Shakespeare’s Sonnet 18 stuck on a loop in the toilets. Enough ‘darling buds’, Hugh. Great Peking Duck! Lovely dim sum as well. 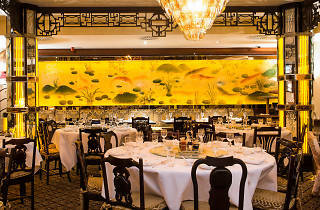 China Tang is a smart casual restaurant that serves Cantonese cuisine situated in the basement of the Dorchester hotel in Park Lane ideal for special occasions. The room has traditional and contemporary Chinese art deco inspired by 1930’s. Although the restaurant is part of the hotel, it has it’s own separate entrance. We began by ordering their Crab and Sweet Corn Soup (£11.00) which was very flavourful.We then shared their Spring rolls (£5.00), Har Kar Shrimps Dumplings (£6.00) and Prawn Cannelloni (£7.00). The spring rolls were perfectly crispy. The Dumplings and Cannelloni both had sumptuous and generous fillings of shrimp and prawn. We then had their Classic Red Cooked Lamb in Clay Pot (£20) which was slow cooked and so incredibly tender - every piece melted in my mouth. Following this, we had their Roast Duck with pancakes (£23.00). We actually didn’t realise that we had opted for Roasted and would have preferred to have tried their Peking Duck which seemed to be the more popular one. Nonetheless, the duck was moist and well prepared. We had this with some Pak Choi (£13.00). For dessert, we shared their Steamed, moist date sponge cake served with Madagascar vanilla ice cream. It was covered with warm toffee sauce and tasted so incredibly tantalising - a winning dessert. The service was extremely professional. Prices are on the high side but the restaurant is located in one of London's luxury hotels. It gets very crowded so it’s advisable to book in advance. It was a truly authentic experience which I absolutely recommend. Not forgetting of course my experience in the toilet. A good restaurant loo is, more often than not, a proper indication of how successful a venue is. It’s not every day I have English poets reading verses to me through the speakers! China Tang is a luxurious, decadent hidden away bar within the Dorchester Hotel with impeccable service and the food is pretty decent too. Crispy aromatic duck pancakes is presented in the classiest way i have ever seen, decent delicious delicate steamed prawn and shanghainese dumplings from their Cantonese Dim Sum menu. Great tasty cocktails and a great selection of quality wines. This provides the perfect intimate setting for a small gathering or celebration, with dimmed lighting and background music reminiscent of the 1930s Jazz era that isn’t too overpowering allowing the guests to chat freely. The washrooms are amazing and the style and attention to decor and detail has been well thought out here. There is a free cloakroom service and the thriving restaurant next door with gorgeous lighting and ornate wooden sliding doors creating an Art Deco elegant atmosphere that seems to propel you back to old Hong Kong era times. On Tuesdays i hear there is often live Jazz here too that I’d love to go back and see. We ate in the private dining room. The food and service were superb. I was not paying the bill. I suspect it was not cheap. Still, if you walk into The Dorchester I don't suppose you are looking for cheap .... just good .... and this is VERY good.